These lessons give you the essence and substance of the best scientific knowledge regarding the prevention and cure of physical ills by the power of the mind. But in presenting the theory and practice of Mental Therapeutics there is absolutely no reference to mysticism or occultism, or strange metaphysical and philosophical theories. Mental Therapeutics is a science, not a superstition; it is something based on sound scientific facts, and not upon vague imaginings. Lesson Xxiv - "The Blood Is The Life"
In these lessons I shall give you the essence and substance of the best scientific knowledge regarding the prevention and cure of physical ills by the power of the mind. But in presenting the theory and practice of Mental Therapeutics to you I shall carefully avoid all reference to mysticism or occultism, or strange metaphysical and philosophical theories. Mental Therapeutics is a science, not a superstition; it is something based on sound scientific facts, and not upon vague imaginings. Nature surely contains enough wonders for us, without the need of our exploring any so-called supernatural realms in our search for the relief of the ills and pains of mankind. The Power that has called us into being has placed at our disposal many wonderful means of self help, and self -cure. There is no need for us to become "spooky" or uncanny when we begin the study of Mental Therapeutics, nor when we carry the theory into the realm of actual practice. There are greater wonders and mysteries wrapped up in the domain of Nature than have ever been dreamed of by man in his search for the supernatural. Neither is there any need of dragging the religious element into Mental Therapeutics, for it has no direct connection with the scientific side of the subject. There is no one who has a greater, deeper, or more profound respect, veneration, and reverence than have I for the Power which is back of all Nature, and which is yet manifest in every one of her activities. Moreover, I firmly believe that a firm faith in that Power has an uplifting effect upon the minds and souls of persons, and therefore tends to keep them in health, and to restore health when it has been lost. But, I believe that theology and Mental Therapeutics are two distinct, fields of human thought and activity. I do not believe in making a religion of Mental Therapeutics, and of mixing theological doctrines with the scientific methods of applying the latter. 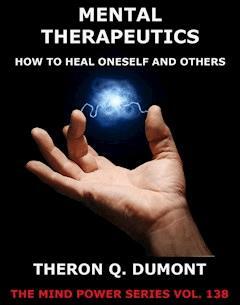 In fact, while many persons have received benefit from Mental Therapeutics administered under the guise and form of religious teaching, I also believe that many more persons have been repelled and kept away from the wonderful benefits of this form of treatment by reason of the strange and queer theological teachings of some of the healers. There is no reason in the world why any person should forsake his or her chosen religion — the faith that has been of such great comfort and consolation to him or her during many years of life — in order to obtain the benefits of the " new " healing methods. Rather do I believe that the best therapeutic methods of this new system may be applied with the best results when the patient is supported by the comforting assurance of his or her own chosen faith. Under the guise of mental healing many persons have been induced to forsake the faith of their fathers, and the faith of their youth; too often with the result that they have become like ships without a rudder, drifting and floating backward and forward with every passing current. These people have let go of the old, without getting a firm hold on the new. At the last, all religion may be summed up in three general principles, viz. : (1) Belief in the existence of a Supreme Being or Power, from whom all life proceeds; (2) faith in, and dependence upon, the goodness of that Being or Power in all the affairs and circumstances of daily life; and (3) living the Right Life, in accord with the highest teachings of the best faiths, and in accordance with the dictates of one's own conscience. Having these principles, and living up to them as closely as one can, one is truly religious, no matter what his faith or profession. So, my students, in these lessons you will not be torn away from the safe anchorage of your religious faith, nor asked to accept some strange and new theology as a precedent to your learning the art and science of healing yourself and others. While, as I have said, all thinking men recognize the presence and being of a Supreme Power, and seek assistance and aid from, and depend upon it accordingly; still we shall find that this Supreme Power has placed within our grasp the means and methods whereby we may study and practice this science, as we would any other science. Mental Therapeutics is neither a religion, nor a theology; it is a scientific system of healing by natural means and methods. Moreover, although Mind is the great force and power with which cures are made under the system of Mental Therapeutics, we shall not be asked to accept any particular metaphysical theory of "What is Mind?" We do not insist upon teachers of physical science telling us exactly what Matter is! The truth is that they do not know; neither does any one else know. And, likewise, no one knows just what Mind is; nor are they likely to know. Mind, Matter, and Energy — these are the three great manifestations of the Supreme Power ; and it has pleased that Supreme Power to render them perhaps forever unknown to us in their final nature. The sanest attitude to take toward these mysteries is that of Herbert Spencer, i.e., that Mind, Matter, and Energy are the threefold aspects of the manifestation of that " Infinite and Eternal Power " from which all things proceed; and which, like the Power that has called them into being, is Unknowable at the last. But, while we do not know "just what Mind is," we most assuredly do know just how it works. Like electricity, the nature of which we do not know either, we have harnessed Mind to do work for us. We have in Mind a wonderful and most potent force or natural energy, and we have learned how to guide, direct, and apply its energies and power in the direction of the healing of physical ills. We have discovered that Mind works as regularly, and as surely, as does electricity. And we know that we may set it to work in special direction, surely and invariably, when we provide the channels for its expression. As we proceed with these lessons, we shall discover also that not only does Mind prevent and cure diseases, but that it also causes diseases. Fear has slain more human beings than the most malignant fever. Its victims are numbered by the millions. And not only does it kill, but it cripples and incapacitates millions, and renders them miserable and unable to live normal lives and to perform efficient work for themselves and those dependent upon them. Like all other great forces. Mind acts negatively as well as positively — it harms as well as benefits. Wisdom consists in learning its laws and principles of operation; and thereby learning to prevent its undesirable working, and to encourage, cultivate and direct its beneficent activities. In these lessons I shall try to bring order out of chaos in mental healing. There has been so much ill-digested teaching on the subject, and so much fanciful and often absurd theorizing, that the intelligent student is often perplexed when he begins the study thereof. A writer upon this subject, in a recent magazine article, has well said: "Past teaching respecting the influence of the mind upon the body has been clouded and distorted by the errors of superstition, the inaccuracies of ignorance, and the exaggeration of fanatical extremists whose prejudiced observations and reports were more or less colored by commercial motives or sectarian enthusiasm. And so it was no little wonder that teaching mental healing grew into a mass of religious contradictions, unreliable observations, and groundless assertions. It has required much painstaking labor on the part of modem physiologists and psychologists to clear away this accumulation of rubbish and ignorance, and to lay a scientific foundation for a rational system of mental hygiene based upon the known laws of mind and matter. " The student will notice that in these lessons I have not confined myself solely to the psychology of Mental Therapeutics. I have accepted the facts of modem physiology as correct; and have directed the use of the power of the mind along the lines of these physiological facts. One of the great mistakes of unscientific practitioners of mental healing has been the fact that they have refused to accept physiology as existent; but have used the mind in a general hit-or-miss fashion. The scientific practitioner, on the contrary, acquaints himself with the physiology of the normal person, and then bends the mental energies toward restoring this normal state and condition of functioning. By knowing just how the organs of the body function in health, the practitioner is better able to picture in the mind of the patient (and in his own mind) exactly what conditions are desired to be created. As the mental picture is the pattern around which Mind creates, it will be seen that the importance of creating the right kind of mental pattern cannot be overestimated. There is a great truth of Mental Therapeutics stated here ; and the student will do well to make note of it. I ask my students, here at the very beginning, to lay aside all preconceived ideas and acquired prejudices. Not that they must accept my theories and methods in preference to their own, regardless of the comparative value thereof; but rather that they should cultivate an open mind to what I have to say, until they are able to grasp the why and wherefore of it. In some cases they may think that I mean something quite different from my real meaning; this by reason of their unfamiliarity with my terms. We all have our own terms, and we are suspicious of new ones. Therefore, we should always be sure that we really understand the real meaning of the terms used by others. Finally, we must once and for all get rid of the idea that Truth is the exclusive possession of any one school of thought or practice. There is a little good in almost all schools and methods ; and the most good is always obtained by analyzing the different theories and methods, and then taking the essence of all that is best, discarding the waste material. This is the true scientific method — the " eclectic " method, combining the best of the many forms and phases examined; selecting the best in each, and combining this in one general system and method. Any other plan results in narrowness and bigotry, both of which is quite unscientific, and quite contrary to common sense. Having now understood the methods and general plan of these lessons, let us now proceed to investigate, examine, and understand the working principles and the basic theories of this great system of the healing art — Mental Therapeutics. One of the first things that the student of Mental Therapeutics should learn is this : That the human body is not a mass of mindless matter, but is, instead, as truly an organ of the mind as is the brain, although its mental work is along different lines. This may seem like a startling statement to the person who has not acquainted himself with the discoveries of modem psychology and physiology. Not only is the body as a whole the outward aspect of an inward mentality, but every part of it (even the cells themselves) has mind immanent within it and acting through it. And, more than this, every part has its own particular mental nature; and every cell its own mental being. There is no part of the body, no organ of the body, no cell of the body, that is without its own mental being or nature. When this important fact is perceived, the fundamental explanation of mental healing is had. The student then no longer speaks of the power of "mind over matter," for he sees that it is really a manifestation of mind over mind — of one kind of mind over another kind of mind. This fact being grasped thoroughly, the whole system of mental cure is perceived as a reasonable and logical idea, instead of a theory opposed to the accepted facts of Nature. Just as the activities of the brain-cells in performing their own allotted work are so closely correlated and combined that they are regarded as a unity, and form our thinking "mind" as a whole; so are the activities of our cells, parts, organs and members of our bodies so closely correlated and combined in their actions and interaction that they form a unity, and may be regarded as one mind working in harmony and unity. For the want of a better name this combined mind may be called " The Corporeal Mind." This term will be used in these lessons to indicate this great indwelling mind which is the active spirit of our physical functions and bodily life. The term "corporeal'' means: "pertaining to a material body." Therefore Corporeal Mind means "the bodily mind." As we proceed we shall discover the qualities, properties, and attributes of the Corporeal Mind. The Corporeal Mind, however, must not be thought of as dwelling apart and separate from the other fields of mental activity which exist in every person. In fact, no part or field of activity in the human being, whether physical or psychical, so dwells apart ; everything is correlated, interdependent, and interactive — all coordinated and harmonious parts of one whole. The Corporeal Mind is really one of the phases or planes of that great field of human mentality known as the Subconscious Mind. The Subconscious Mind performs about eighty percent of the mental activity of the person ; the remaining twenty percent being left for the Conscious Mind to perform. Just as the Conscious Mind consists and is composed of the many faculties of sensation, perception, thought, etc., so is the Subconscious Mind composed of numerous distinct planes or fields of subconscious mental activity. The many excellent works on the Subconscious Mind have given the world full information regarding the activities of this great field or plane of mentality. It is not necessary for us to consider the general subject here; so we shall confine ourselves to merely that part of the Great Sub-consciousness that relates to the functions of the human body, i.e., the Corporeal Mind. But, in our consideration of the subject we must not omit the consideration of the important fact that the Corporeal Mind, like all other phases or aspects of the Subconscious Mind, responds to the ideas, suggestions, and orders given it by the Conscious Mind of its owner. And, also it "takes up,'' or accepts the ideas, suggestions, or commands of the minds of others, unless its owner orders it not to do so. This important psychological fact explains the undoubted occurrence of the causing of disease by the accepted ideas and suggestions of others, or of one's own conscious mind; and, likewise, the cure and removal of disease by the same causes. Before proceeding to the consideration of the details of the nature of the Corporeal Mind, it will be best for us to consider this fact of the acceptance of the ideas and suggestions, or autosuggestions, by the Corporeal Mind, and its response thereto. It is always well to become acquainted with the general principles and laws before proceeding to the study of their detailed and particular manifestations. I. The Subsconscious Mind accepts as true any idea suggested to it, or impressed upon it; unless (a) there already exists in the Subconscious Mind a contrary idea sufficiently strong to counteract the new one; or (b) the Subconscious Mind has acquired a certain mental trend, or habit of thought, which is opposed to the introduction of the new idea; or (c) the Subconscious Mind is commanded by its owner not to receive or accept such suggestions or ideas, or classes of ideas. n. The Subconscious Mind proceeds to logically manifest the conclusion of the suggested and accepted idea ; to make it take form in action or physical condition; to adopt it as a habit of manifestation and action, thereafter. III. The Subconscious Mind will continue to manifest along the lines of the accepted suggested idea until either (a) it is neutralized, cancelled, and replaced by a sufficiently strong opposing idea or suggestion; or (b) the accepted suggested idea is traced back to its birth in the mind of the person, and is thereupon shown to be erroneous, based on wrong premises, and therefore untrue; in both of which cases it is wiped from the tablets of the mind, and cease to manifest — or, to be more exact, it is thus painted over by the new and true idea, and ceases to appear in the mind, or to manifest in action or form. The student is cautioned against regarding the term " Suggestion " to mean any mysterious use of the mind ; or as being confined to certain forms of ideas. The term " suggestion " means merely "an indirect or guarded mode of presenting an idea, especially an argument or piece of advice.'' It is distinguished from argument, or logical proof, by the absence of formal evidence or discussion. A suggestion is usually merely an idea which seems plausible, and which is advanced with an air or appearance of truth, reality, or accepted fact. An " auto-suggestion'' is a suggestion advanced by the conscious mind of the person himself, usually derived from the " working over" of ideas which he has heard but which were not accepted at the time ; although when the person is acquainted with the psychology of suggestion he may deliberately form ideas which he deliberately "auto-suggests" to his Subconscious Mind as facts. (1) Authority. Persons are strongly affected by ideas suggested with an air or appearance of authority. Persons exercising authority, such as priests and preachers, teachers and instructors, physicians, lawyers, judges, persons in charge of and directing other men, writers, public speakers, etc., manifest an appearance of authority, and speak in tones of authority, hence their suggestion carry with them a weight which in many cases is out of all proportion to their truth or real value. (2) Acquiescence, or Imitation. Persons accept implicitly, in many cases, the ideas of those around them. They imitate the mental states of others, and accept their ideas and belief becomes of the influence of numbers. " Everyone thinks so-and-so '' takes the place of proof in their minds. More than this they " take on " the physical conditions of those around them, for the same reason. The Subconscious Mind is quite imitative, and readily falls into the habit of accepting the beliefs, ideas, and conditions of those around its owner. (3) Association. Persons accept easily suggested ideas which resemble other ideas which they have previously accepted. They associate the new idea with the old one, although there may be little or no resemblance between them. Consequently, shrewd and unscrupulous men sometimes impose upon honest persons in this way, i.e., they make themselves, or their proposition, appear like some other person or proposition which has been satisfactory to the person, and this associated sameness disarms the person and causes him to accept the suggested idea far more readily than he would have otherwise. The confidence man, charlatan, and fakir operates along these lines of suggestion. And, likewise, many persons accept suggestions concerning their physical condition, because of this fancied resemblance to something else, which they otherwise would have refused to notice. An important law of suggestion is this : Suggestion gains force by repetition. The first suggestion may make but little impression ; but the same suggestion repeated frequently makes a deeper impression by each repetition; until finally the idea is firmly impressed upon the Subconscious Mind of the person. We shall not consider the important results of suggestion in general, for we are concerned merely with those which produce physical effects. When the Subconscious Mind accepts suggested ideas relating to physical conditions, functioning, health, etc., it at once passes the idea over to that phase, aspect, or department of its activities that we have called the Corporeal Mind. The Corporeal Mind then proceeds to manifest into reality and physical form and function the idea so placed within it, and which it accepts as truth in absence of opposing ideas. In this way many persons have developed conditions of disease from purely mental causes, and many have died from the logical development of such diseases. Many persons are made ill from fear and suggestions of contagion and infection. Many persons acquire disease by reason of vivid pictures placed in their minds through reading newspaper descriptions of disease, patent medicine advertisements, etc. It is a fact known to all officials of the medical schools that students frequently "take on" all the symptoms of the diseases they are studying about in their text-books. And, likewise, the law works with equal force in the opposite direction. For all the cures made by the faith-healers, prayer-curists, divine healers, and other practitioners of the same kind; and by the practitioners of mental therapeutics, suggestive therapy, and similar scientific methods of applying the power of the mind to cure physical ills; are really based upon this fundamental principle. This may seem strange to the student when first stated; but a careful examination of the facts of the case will bring to him such an overwhelming proof of its correctness, that it will seem strange to him that anyone can doubt it. Remember, though, that Therapeutic Suggestion means simply the indirect placing of an idea in the Subconscious Mind in such a way that it is accepted as truth, and thereupon manifested in action, form, and functioning by that phase of the Subconscious Mind known as the Corporeal Mind, which has control of the functions and activities of the physical body. The student of physiology and of psychology cannot expect to have a sound base and foundation for his structure of knowledge unless he becomes thoroughly familiar with the nature and character of the cells of which the entire human body is composed. The corporeal cells are those very minute elementary structures of which the organic tissues are composed. By tissues is meant the elementary materials, varying in structure and function, which compose the bodily organs, members, and parts. And, consequently, the cell is the physical base of the activity of the Corporeal Mind. So, from the position of both physiology and of psychology the cell is the logical subject of the beginning of study and investigation. The corporeal cells are very minute; in fact, they are microscopic. From them are built up the muscles, tissues, nerves, blood, bones, hair, and nails. From the hardest enamel of the tooth to the most delicate and soft tissue of the mucous membrane, the human body is found to be composed of cells. And these cells are, for all practical purposes of comparison, identical with the single cells which exist as independent entities or living creatures in the lowest forms of the life scale. So that, at the last, every human body is in reality a great community of cells, grouped and associated, coordinated and combined for cooperative work and functioning, yet each a separate living organism. Each of these cells is nucleated, that is to say it has as it center a nucleus which is the most vital point of its being. The nucleus of the cell is its central life-spot; which may be compared to the yolk of an egg. It is more complex than the general substance of the cell, and seems to contain within itself the essence of the life and being of the cell. The cells reproduce themselves by growth and division; they are born, perform their tasks, give birth to other cells, and then die. The cells preserve a certain degree of individuality and separateness, though their work is performed by reason of their tendency to combine with other cells into groups, and these into still larger groups, and so on ; a constant relation being maintained between the members of each group, and so on until all the cells in the body are considered as a great group connected in all of its parts and divisions. And now let us take a glance at the work performed by these wonderful little bits of living substance, in their various groupings and association with each other. Physiology recognizes about forty different kinds of cells, yet all belong to the one great family of cells. Their differences are merely such adaptations to function, work and purpose as we might expect; the differentiation having resulted in the course of organic evolution. For instance, we find the great family of muscle-cells, which are adapted to their work of contracting the muscles which they compose. Then there are the connective-tissue cells which join together and form the tough fibrous tissue which binds together and protects the various parts of the organism. Then again, we find the bone cells which select, arrange, and set in place the lime material of which the bony parts of the body is composed. Then we find the several group of cells which select and place in position the silicate mineral substances which are needed to form the nails, the hair, and other similar parts of the body. Then there are the gland cells which work industriously to secrete the fluids needed in digestion and similar vital processes. Then we discover the very active family of blood cells the members of which work to build up and repair the various parts of the system, and to do the scavenger work of carrying off the debris of the system to be burned-up by the oxygen in the lungs. And, passing over many equally important families of cells, we finally come to the family of brain and nerve cells, the work of which renders possible all feeling, thinking and acting of the human being. The cell families of the body are like a great cooperative community, each cell and each group of cells performing its own work in the community, each acting for its own good, and the good of its particular group, and at the same time for the good of the entire body of cells. You must here remember that the body exists only as a body of cells — a great co-operative community of cells. It is not sufficient to say and think that ''the body has cells" but rather that ''the body is a collection of cells" or even "the cells are formed into a body of cells"
Some of the cells are on the active line, while others are held in reserve to be called upon in case of sudden need. Some are stationary, while others remain stationary until called into motion, and a third general class is always moving about ; of this moving-about class some make regular trips, while others are rovers and free adventurers, like tramp ships sailing from port to port without making regular trips, between ports. Some of the cells carry burdens of material from place to place — building material needed by certain stationary cells performing building work. Other cells perform scavenger work, and gather up the garbage of the system. Other cells perform police work, and arrest intruders in the system, often actually locking them up by building a wall around them. Other cells form the army which repels the microbes and germs of disease which have invaded the system. The cells of the nervous system form a living telegraph wire, joining hands (so to speak) and passing along the message from one end of the line to another. The number of cells in the human body is countless. A faint idea of their almost infinite number may be formed by considering the fact that in each cubic inch of blood there are over 75,000,000,000 (seventy-five thousand million) of the red-blood cells alone, not taking into consideration the millions of other kinds of cells. The red blood cells travel along in the blood flowing through the arteries and veins ; first taking up a supply of oxygen from the lungs, and carrying it through the arteries to the various parts of the body, where they deliver it to the cells requiring it for vital processes. Then, starting on their return journey through the veins, they gather up the waste products of the system, such as the broken down cells which have been used up ill their work and which have died; this debris is finally consumed in the crematory of the lungs, and thrown off as carbonic acid gas by the breath. Some of these cells force their way through the wall of the arteries and veins, and through the various tissues of the body, when upon hurried calls for repair work. out of the system. Boils and pimples are manifestations of this ejecting process on the part of these cells. Other cells are laboratory chemists, and extract from the food the elements needed to manufacture the important juices of the system, such as the gastric juice, pancreatic juices, saliva, bile, etc., and also such other secretions as the milk, etc. Not only do these cells select such elements, but they also actually combine them in the proper proportions for the required chemical work. But perhaps the busiest classes of cells, and the most numerous, are those whose work it is to continually build up and keep in repair the body as a whole. You must remember that the body is constantly undergoing change; constantly breaking down cells; constantly repairing the damaged places with new cells. Our bodies, in all of their parts, are being continuously made over. All of the work of this kind, whether it be the growth of new hair or finger nails, or the slower processes of other parts of the body, is performed by these minute workers, the cells.